Welcome Ms. Miller's Kindergarten Class! Welcome Kinder Families! My name is Hayden Miller. I am in my second year teaching and am excited to begin my career at Cary Elementary! I received my undergraduate degree in Psychology and Child Development from Peace College in 2008. 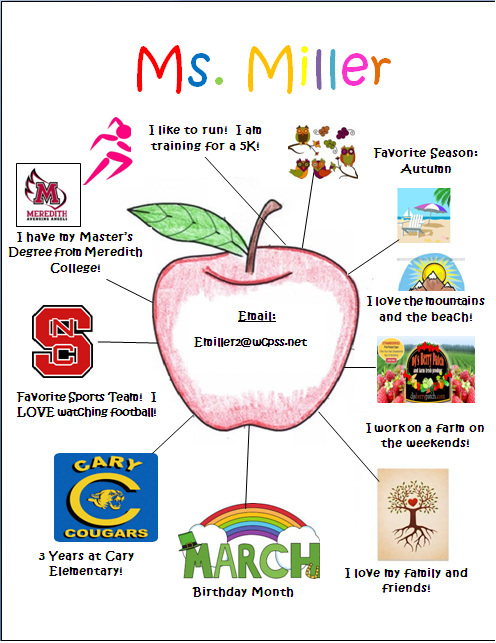 I graduated in December 2011 from Meredith College where I received my Masters of Arts in Teaching degree. Educating Kindergarten students is very near and dear to my heart! My mother has been a Kindergarten teacher assistant for over 17 years. Throughout this time, I have had rich experiences working with young learners within her classroom. I am incredibly blessed to be pursuing my passion in education. I am ready to pair my experiences and my education to help our Kinders learn and grow within the classroom. I am a native of Apex, North Carolina and am proud to call it my home. In my free time, I love to spend time with friends and family, attend N.C. State football games, exercise, and travel to the mountains and coast of North Carolina. Most importantly, I am an avid reader and writer. I truly believe in the power of instilling learners with a passion for reading and writing at an early age. I look forward to being a positive educational influence in the lives of your children. Feel free to email me at emiller2@wcpss.net if you have any questions. We show PRIDE in Kindergarten! Excellence in all you do! Each week, Ms. Miller and Mrs. Wilson choose a student who has been the PRIDE leader in their classroom and deserves the PRIDE paper plate award! 1. 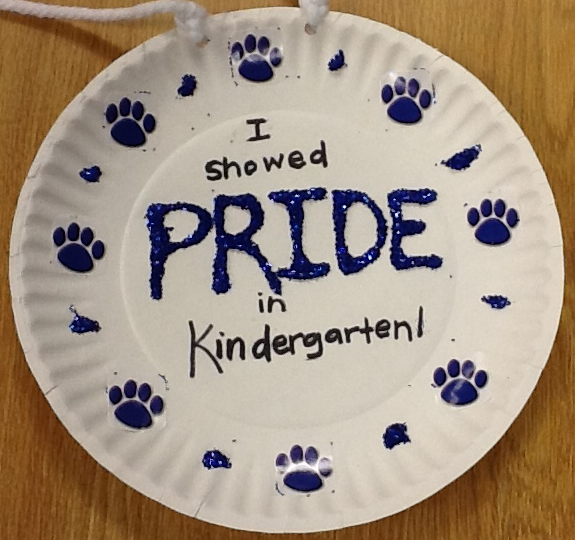 What do you do to show PRIDE in Kindergarten? 2. What is your favorite thing about Kindergarten? 3. Tell us something special about you. letterland is a magical land where our students "travel" to learn about letters, their sounds, & the special characters that help them learn our alphabet. Over the past couple of weeks, some of you have probably heard names like "Clever Cat", "Annie Apple", or "Harry the Hatman". These are all characters found within the Letterland program. 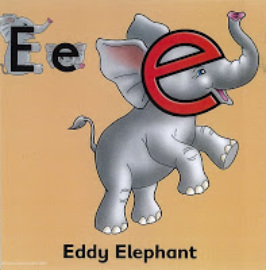 This program is designed to help students learn the letters of the alphabet and the sounds associated with these letters in a meaningful, engaging, and fun way within the classroom! In the past three weeks, students have met every letterland character, heard their sound, and learned vocabulary words associated with each character. This week and for the remainder of the year, we will focus on two letters per week. We will learn new vocabulary, learn about capital and lowercase letters, learn how to write each letter, and most importantly how to apply what we know about letters and their sounds while reading and writing. Counting to 100 by 1's, 5's, & 10's! This quarter, we are practicing counting to 100 a variety of different ways. We want to build a strong set of counting skills. At home, COUNT, COUNT, COUNT with your child. Help them see counting as a valuable skill in the real world. At home practice counting to 100 by 1's and by 10's. This will help students begin to see the patterns in our number system and will help provide the foundation for understanding place value. 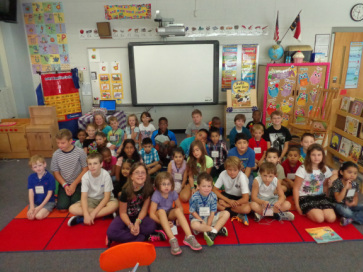 Today, Cary Elementary School celebrated International Literacy Day! What a wonderful morning we had! :) Fifth grade friends from Mrs. Perez's classroom and Ms. Kenney's classroom paired with our Kinder friends and read a variety of stories in small groups. We then discussed in a large group the importance of reading and the uses we have for reading. We also were read the story, Today I Feel Silly by Jamie Lee Curtis and talked about how we were feeling after such a great morning reading stories and making new friends! I hope this event kicks-off a great year full of excitement and fun with reading this school year! -September 10th: Fall PTA Fundraiser - Go, Play, Save Books!